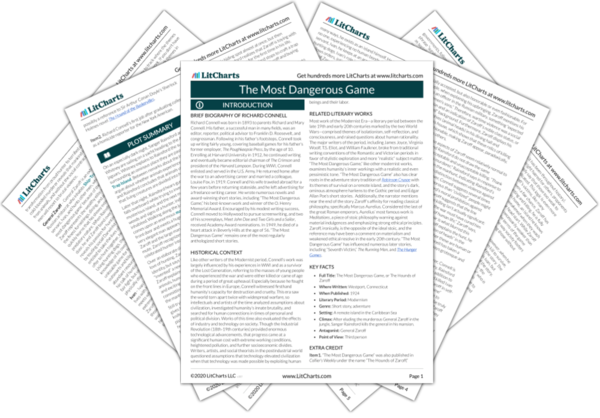 Instant downloads of all 942 LitChart PDFs (including The Most Dangerous Game). 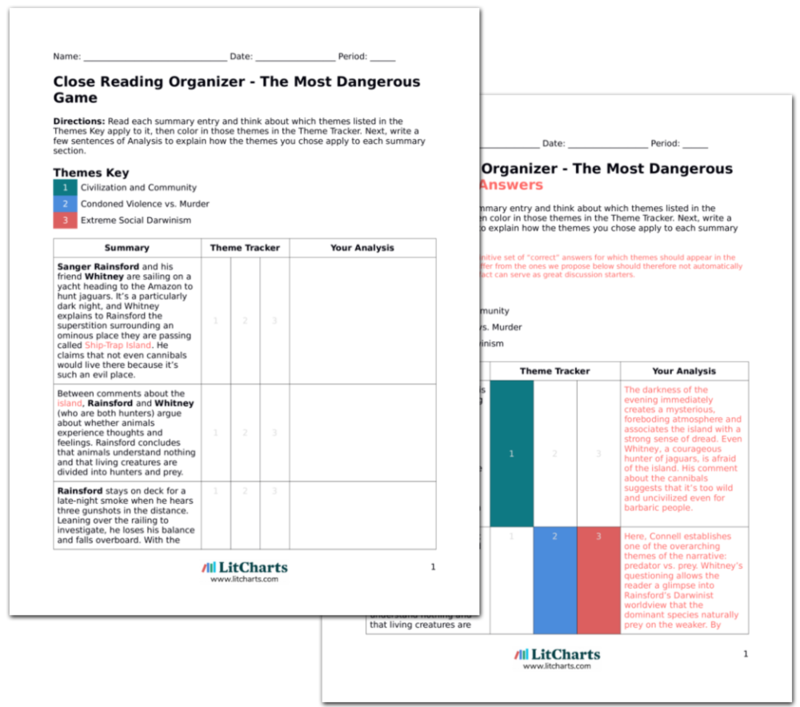 Welcome to the LitCharts study guide on Richard Connell's The Most Dangerous Game. Created by the original team behind SparkNotes, LitCharts are the world's best literature guides. A concise biography of Richard Connell plus historical and literary context for The Most Dangerous Game. A quick-reference summary: The Most Dangerous Game on a single page. In-depth summary and analysis of every of The Most Dangerous Game. Visual theme-tracking, too. Explanations, analysis, and visualizations of The Most Dangerous Game's themes. The Most Dangerous Game's important quotes, sortable by theme, character, or . Description, analysis, and timelines for The Most Dangerous Game's characters. Explanations of The Most Dangerous Game's symbols, and tracking of where they appear. An interactive data visualization of The Most Dangerous Game's plot and themes. Richard Connell was born in 1893 to parents Richard and Mary Connell. His father, a successful man in many fields, was an editor, reporter, political advisor to Franklin D. Roosevelt, and congressman. Following in his father’s footsteps, Connell took up writing fairly young, covering baseball games for his father’s former employer, The Poughkeepsie Press, by the age of 10. Enrolling at Harvard University in 1912, he continued writing and eventually became editorial chairman of The Crimson and president of the Harvard Lampoon. During WWI, Connell enlisted and served in the U.S. Army. He returned home after the war to an advertising career and married a colleague, Louise Fox, in 1919. Connell and his wife traveled abroad for a few years before returning stateside, and he left advertising for a freelance writing career. He wrote numerous novels and award-winning short stories, including “The Most Dangerous Game,” his best-known work and winner of the O. Henry Memorial Award. Encouraged by his modest writing success, Connell moved to Hollywood to pursue screenwriting, and two of his screenplays, Meet John Doe and Two Girls and a Sailor, received Academy Award nominations. In 1949, he died of a heart attack in Beverly Hills at the age of 56. “The Most Dangerous Game” remains one of the most regularly anthologized short stories. 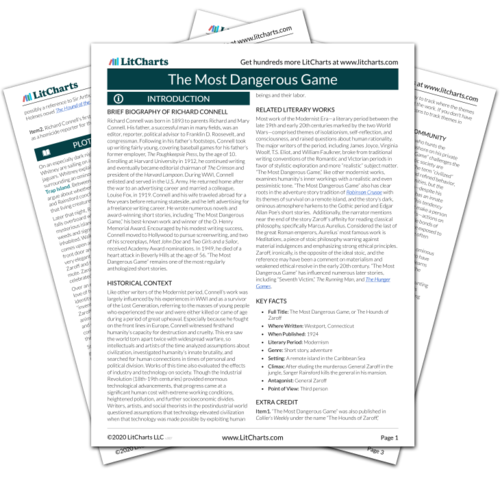 Get the entire The Most Dangerous Game LitChart as a printable PDF. Like other writers of the Modernist period, Connell’s work was largely influenced by his experiences in WWI and as a survivor of the Lost Generation, referring to the masses of young people who experienced the war and were either killed or came of age during a period of great upheaval. Especially because he fought on the front lines in Europe, Connell witnessed firsthand humanity’s capacity for destruction and cruelty. This era saw the world torn apart twice with widespread warfare, so intellectuals and artists of the time analyzed assumptions about civilization, investigated humanity’s innate brutality, and searched for human connections in times of personal and political division. Works of this time also evaluated the effects of industry and technology on society. Though the Industrial Revolution (18th-19th centuries) provided enormous technological advancements, that progress came at a significant human cost with extreme working conditions, heightened pollution, and further socioeconomic divides. Writers, artists, and social theorists in the postindustrial world questioned assumptions that technology elevated civilization when that technology was made possible by exploiting human beings and their labor. Most work of the Modernist Era—a literary period between the late 19th and early 20th centuries marked by the two World Wars—comprised themes of isolationism, self-reflection, and consciousness, and raised questions about human rationality. The major writers of the period, including James Joyce, Virginia Woolf, T.S. Eliot, and William Faulkner, broke from traditional writing conventions of the Romantic and Victorian periods in favor of stylistic exploration and more “realistic” subject matter. “The Most Dangerous Game,” like other modernist works, examines humanity’s inner workings with a realistic and even pessimistic tone. “The Most Dangerous Game” also has clear roots in the adventure story tradition of Robinson Crusoe with its themes of survival on a remote island, and the story’s dark, ominous atmosphere harkens to the Gothic period and Edgar Allen Poe’s short stories. Additionally, the narrator mentions near the end of the story Zaroff’s affinity for reading classical philosophy, specifically Marcus Aurelius. Considered the last of the great Roman emperors, Aurelius’ most famous work is Meditations, a piece of stoic philosophy warning against material indulgences and emphasizing strong ethical principles. Zaroff, ironically, is the opposite of the ideal stoic, and the reference may have been a comment on materialism and weakened ethical resolve in the early 20th century. “The Most Dangerous Game” has influenced numerous later stories, including “Seventh Victim,” The Running Man, and The Hunger Games. Climax: After eluding the murderous General Zaroff in the jungle, Sanger Rainsford kills the general in his mansion. Item1. “The Most Dangerous Game” was also published in Collier’s Weekly under the name “The Hounds of Zaroff,” possibly a reference to Sir Arthur Conan Doyle’s Sherlock Holmes novel The Hound of the Baskervilles. Item2. Richard Connell’s first job after graduating college was as a homicide reporter for the New York American. McLendon, Kelsey. "The Most Dangerous Game." LitCharts. LitCharts LLC, 23 Mar 2018. Web. 19 Apr 2019. McLendon, Kelsey. "The Most Dangerous Game." LitCharts LLC, March 23, 2018. Retrieved April 19, 2019. https://www.litcharts.com/lit/the-most-dangerous-game.